The new Meiho University library showcased in April 2007. 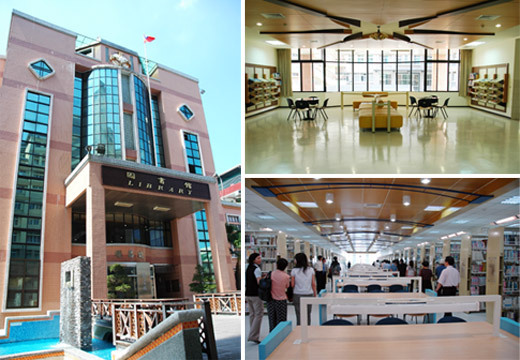 The new library has three floors, which includes Multimedia desk, Current Periodicals, Multi-lingual Learning Center, Instructor’s Area, Meeting Rooms, Study Rooms, Rare Collections Area, Meiho Archives, and WebPAC Area, which includes 59 computers. The library does not only serve the on-campus readers, but also is open to the community. The 100% coverage of wireless and the diverse accesses of information are attractive to both of the on-campus readers and community; furthermore, the mixed atmosphere of academic and leisure style is appreciated by all kinds of readers. The library collects titles of various fields and subjects, such as nursing care, healthcare management, business administration, financing, early childhood education, information management, applied foreign languages, beauty science, and recreation sports and wellness promotion. The number of collection increases at an average of 10,000 titles annually, with a current total of 300.000 titles.